Benjamin Franklin, the oldest and one of the most famous signers of both the Declaration of Independence and the Constitution, was born in 1706 in Boston, the tenth son of a soap and candle maker. Between the ages of ten and twelve, he served as an apprentice with his father. Later, he learned the printing trade from his half-brother, James. James Franklin began publishing the fourth newspaper in the colonies, The New England Courant, in 1721, and Benjamin managed to have fourteen of his essays published in it. With time, however, a certain level of antagonism grew between the two brothers, and Benjamin Franklin departed for Philadelphia, and later for London. Upon his return to the colonies, he became quite prominent in the printing business, publishing the Pennsylvania Gazette from 1730 to 1748. Of even greater success, however, was his annual Poor Richard's Almanac which became the most popular work in the Colonies after the Bible. Over time, Franklin also gained fame for his philanthropy and the general interest he showed in causes such as libraries and hospitals. Franklin was also a talented scientist. Benjamin Franklin was quite active politically as well. In addition to serving on the colonial legislature from 1751-1764, he held the posts of deputy postmaster of Philadelphia (1737-53) and deputy postmaster general of the Colonies (1753-74). 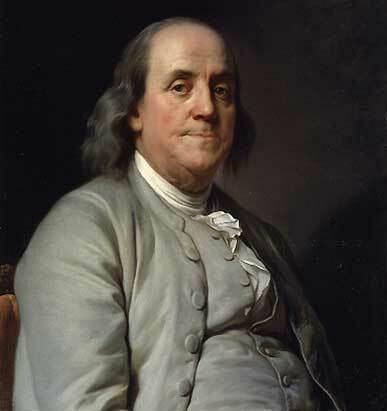 From 1757 to 1762 and from 1764 to 1775, Franklin lived in England, acting as an agent for Pennsylvania, Georgia, New Jersey and Massachusetts. It was during his second stay that he evolved from an English loyal into a Colonial patriot. The Stamp Act lead Franklin to defend the colonies in the House of Commons. When Franklin returned to Philadelphia in May of 1775, he became a member of the Continental Congress. During the Congress he was part of the committee that helped draft the Declaration of Independence. Later, he served as president of the Pennsylvania Constitutional Convention, and traveled to Europe as a diplomat. Between 1776 and 1779 he worked in France, negotiating for an alliance and for treaties of commerce. With the aid of John Jay and John Adams, he negotiated the Treaty of Paris which brought the War for Independence to a close. From 1785 to 1787 Franklin was back in Pennsylvania where he was elected president of the Supreme Executive Council of Pennsylvania. He attended the Constitutional Convention in 1787, and while he was not in complete accord with various parts of the Constitution, he signed it all the same, and even served as a mediator of disputes that arose between different delegates. Toward the end of is life, he wrote his autobiography and became active in the anti-slavery movement. He was chosen to be the first president of the Pennsylvania Society for Promoting the Abolition of Slavery (he had actually been involved in the movement since the early 1730's). He passed away at the age of eighty-four in 1790, and was buried in the Christ Church Burial Ground.